The other day, Fangirls, I sat down to read Harley Quinn, and started to have a feeling that I was reading the wrong one. I was looking at 20, and thinking to myself, this cover doesn’t make sense…shouldn’t she be going after the captain? When I looked up Harley’s covers, I realized that somewhere in my travels and vacations, I had picked up issue 20 before 19, and went into a panic. I wasn’t going to make it to a comic shop before today, and I didn’t know what to do. So I went onto DC Comic’s website, to see my options, and was reminded that digital comics exist! So I bought issue 19 on iTunes, and here we are! In this issue, Harley has to find a way to get her girls (and boy) back from Captain Horatio Strong; an old seadog under the influence of some alien seaweed. He has beaten and captured all of them, so Harley gets Ivy and Tony to scatapult her to his boat, and she comes in ready to smash his face in. 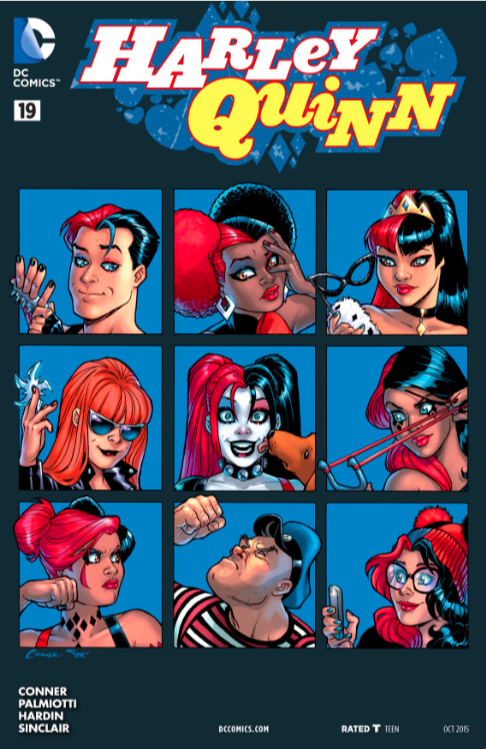 I think this is fantastic, because the issue starts right off with Harley saying how much she cares about her gang. She wants them to be okay, and is willing to do whatever she can to keep them safe. She lands on the ship, and is thrown around a bit by Strong. The seaweed he was munching on doesn’t do much good to his stomach though, and he runs for the poop deck. Gnarly Quinn (the gassy one) goes down to see if he’s passed out, and a couple minutes later is throw into the drink. He isn’t passed out, he’s just passed a lot, and now he’s pissed. At least men are shown objectified in this comic too! As Strong attacks, he is blown back by a gun; the mother of the Quinntuplets is coming in, with literal guns blazing, there to save her girls. She takes Strong down, pulls in Gnarly Quinn, and then has a few choice words for Harley; namely that Harley shouldn’t be adding members to her gang when they are only 14! Of course, Harley didn’t know their age, so she felt terrible, but the mother invited her over for lasagna for feeding and housing her girls while she was gone. Happy ending and all, there are five fewer Harley’s to watch over, and there is still a lot of money being owed by the gang; as they were sent to the hospital and have pain pills and damages to take care of. 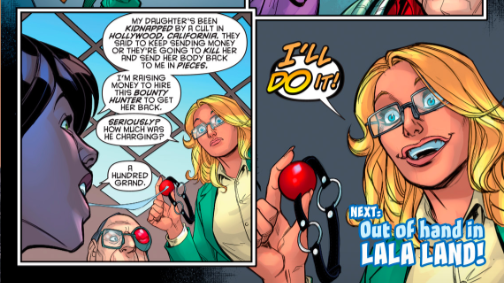 So when Harley hears about an opportunity to make some extra money from someone at her “real” job, she jumps on it! I liked this issue; it had a lot of love in it, which is always so nice to see. Yes, it did have the violence that Harley’s comics are known for, but I’m always so glad to see the love she has for her friends and her enthusiasm. 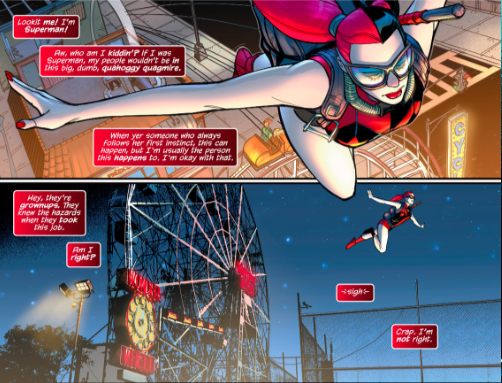 This is my favorite version of Harley Quinn, because she isn’t worried about the Joker; she’s independent, having a great time on her own, and just doing her own thing. It’s a fantastic book.